When seeking a nanny for your children or looking for a nanny job, most people focus on whether or not the position is a good fit for the family and the nanny. To ensure a continued good fit after hiring, though, it is recommended that the family and nanny iron out a nanny contract that sets the expectations for all involved. Drawing up a nanny contract gives the parents and the nanny an opportunity to discuss wants, needs, ground rules and responsibilities associated with the care of the children. These open discussions can then lead to a binding agreement that protects all parties should any problems crop up in the future. What is a Nanny Contract? A nanny contract is a legally-binding document that outlines the responsibilities of both the family and the nanny. Work Hours: Whether the position is for a live-in or live-out nanny, the contract should cover specific work days, times to report for work and days off. If evening care is needed, outline specific days and times as well as how much notice a family will provide when the schedule changes. Compensation Package: Beyond the salary, the contract should stipulate if the family will provide health insurance, vacation days, paid holidays, paid sick days and room and board. In addition, a pay schedule should be established so the nanny can rely on consistent income. Many families will also detail how the nanny will be paid (check, direct deposit or cash). If overtime is expected, this needs to be detailed as well. Duties: In the contract, outline the specific responsibilities of the nanny. Will he or she be responsible for transporting the children to activities and school? What household tasks are expected to be completed? Will he or she need to prepare all family meals? Accommodations: If you are hiring a live-in nanny, determine what accommodations will be provided, if there will be access to vehicles for transportation and what the expectations are for use of the home. Behavior Code: Many times, families have beliefs that differ from the nanny’s. It helps to have a clause in the contract that outlines acceptable behavior. For example, outline your policies for cell phone and computer use, visitors, discipline strategies and language. If religious differences are an issue, the contract can outline what and how the parents wish to have the children practice. Emergency Plans: A nanny contract can help all parties plan for the unexpected. You should provide guidelines for how a nanny should contact you or other family members in the event of an emergency, any necessary medical guidelines for each child, and preferred facilities and hospitals. In addition to the contract, have an emergency contact list in the home. Employee Reviews: When hiring a nanny, it is helpful for all parties to check in on progress periodically. The contract should outline how employee evaluations and reviews will be conducted with the nanny. Confidentiality: Depending on the family’s preference, it is common to add a confidentiality clause to a nanny contract. The contract should stipulate that financial, personal, career and medical information will not be discussed outside of the family. In addition, the contract should also stipulate if the nanny can or cannot post pictures of the children or mention the family on social media sites. Resolution of Employment: In the case that a nanny or family determines that the contract or position should end, a nanny contract should outline procedures for notice and severance. For example, many contracts stipulate that a two-week notice is necessary. Some families may opt for a longer term for notice. If the family is willing to offer severance, this should be clearly stated in the contract. In the event that the family decides to end the contract versus the nanny, the procedure for finalizing all pay and responsibilities should be clear in the contract. It is possible for the family to draw up the contract if the information is straightforward and agreed upon by the nanny. 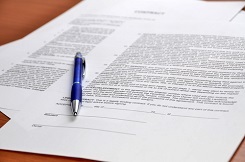 In this case, all parties would need to sign and date the agreement and make copies to keep on hand. Some families, though, choose to draw up the contract with an attorney. According to Bob King, attorney and founder of Legally Nanny, having an attorney complete the forms can safeguard all parties and free up time for the family. King processes nanny contracts, compiles and fills out all legal forms, and handles legal and tax issues. This way, clients are freed up to focus on the care of the children and spend more time with their families, says King.